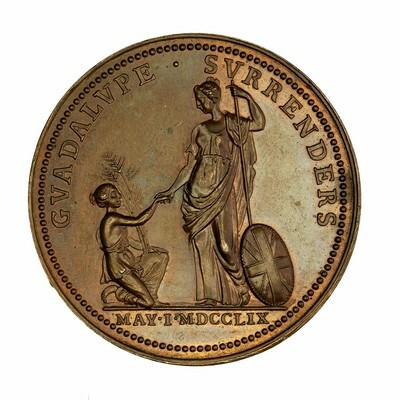 Obverse: GVADALUPE . SURRENDERS; in ex., MAY . I . MDCCLIX - Britannia stands leaning upon spear, and facing l., clasping r. hand to that of kneeling figure on l., who holds cluster of sugar canes; at r., shield with British crosses. Note: 567.6gns. Slightly rusted obv. die. 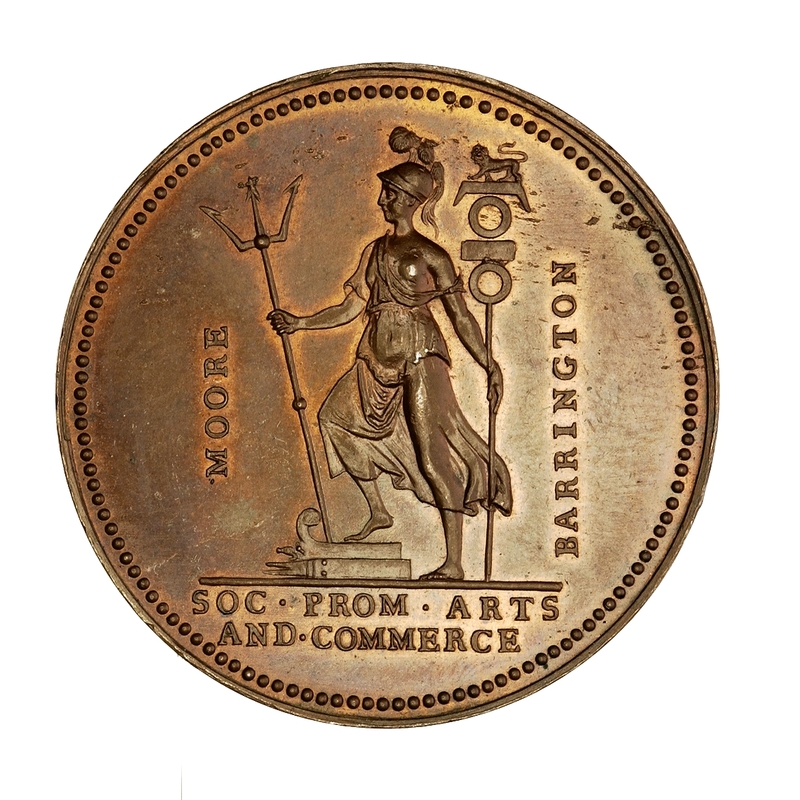 These dies were cut by Pingo from designs finished by Stuart, under the direction of Mr. Thomas Hollis, who had charge of the issue of a large number of medals of this period. The Society Promoting Arts and Commerce mentioned on the medal, established in London in 1754, offered prizes for the best designs of medals commemorating British victories and struck numerous pieces, one of its earliest being intended "as an honorable encouragement to young gentlemen and ladies of fortune and distinction." On the 29th of January 29, 1759, three line-of-battle ships ranged themselves in a line with the town of Basseterre in Guadaloupe, and commenced a furious attack on the town and batteries, which was returned and kept up on both sides, with great spirit, for many hours. About 5 o'clock in the evening, the fire of the citadel slackened, and at 10 many parts of the town were ablaze. Next morning, the troops landed without opposition, and after taking possession of the town and citidal, encamped in the neighbourhood and established small posts on the hills nearest the town. Lieutenant Alexander McLean of the Highlanders, distinguished himself on this occasion. Mr. McLean lost an arm; however, it would appear that this did not injure Lt. Maclean in the esteem of the ladies of Guadaloupe: "He was particularly noticed by the French ladies for his gallantry and spirit, and in the manner he wore his plaid and regimental garb. "On the 13th of February, a detachment of Highlanders and Marines were landed in Grandeterre, in the neighbourhood of Fort Louis, after which, "a party of Marines and Highlanders drove the enemy from his entrenchments, and taking possession of the fort, hoisted the English colours." But disease had made such ravages that many were either dead or in hospital.Anxious to complete, with all possible dispatch, the reduction of the colony, and to meet the enemy in their own manner of fighting, the Commander embarked his troops with an intention of removing the war to Grandeterre and Capesterre, leaving one regiment in the citadel of Basseterre. General Barrington having established himself in Grandeterre, ordered Colonel Crump to attack the towns of St. Anne and St. Francis. This was executed next morning at sunrise, with great spirit. Notwithstanding the fire of the enemy from their entrenchments and batteries, both towns were carried with little loss, Ensign McLean of the Highlanders being the only officer who fell in the assault.The General then formed a design to surprise Petit Bourg, St. Mary's and Gouyave, on the Capesterre side. After landing near the town of Arnonville, the river, rendered inaccessible, except at two narrow passes by a morass covered with mangroves, was fortified by a redoubt and entrenchment. Notwithstanding these disadvantages, the commanders determined to hazard an assault, and began the attack with a fire from their field, and the Royal Highlanders pushed forward. The enemy beginning to waver as they advanced, the "Highlanders drew their swords, and supported by a part of the other regiment, rushed forward with their characteristic impetuosity, and followed the enemy into the redoubt, of which they took possession. "In a succession of skirmishes they forced the enemy from their strongholds, and obtained possession of all the batteries and towns on the sea-coast. At length, the enemy were compelled to surrender, after a gallant defence, which was maintained to the 1st of May, when the capitulation was signed. The loss of the British on this expedition was severe; but, in consequence of their continued fatigues and exposure, they suffered more by the climate than by the enemy.Source: "Sketches of the Character, Manners and Present State of the Highlanders of Scotland; with details of The Military Service of The Highland Regiments", by Major-General David Stewart, Vol I and II, (1825), Edinburgh. -Highland Regiment: Royal Highlanders (42nd), being seven companies of the 2nd Battalion-Other Regiments: Old Buffs, Kings, 6th, 63rd, 64th, and 800 Marines-Commanders: Major-Generals Hopson and Barrington, and Brigadier-Generals Haldane, Armiger, Trapaud and Clavering; fleet commanded by Commodore Moore.